Reduces pores and prevents glare. Combat wrinkles and signs of aging. 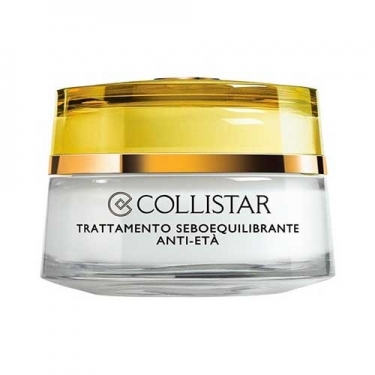 DESCRIPTION: Anti-Age Sebum-Balancing Treatment from Collistar is an effective anti aging treatment designed especially for combination skin to oily. Its formula has a double action; regulates the activity of sebaceous glands, purifies and eliminates the typical imperfections of these types of skin, at the same time it has a regenerative effect and anti age combating wrinkles and sagging. The result is a tougher skin, firm and dull. Apply morning and evening on cleansed face and neck, after the tonic. Ideal for oily to combination skin.